California Vehicle Code (CVC) section 23546 defines a third offense and the penalties involved. A third offense occurs when the person accused of DUI already has two DUI convictions within the past 10 years. In California, people who have two or more DUI convictions within 10 years are labeled as “habitual drunk drivers.” This means that a third offense DUI carries enhanced and more serious penalties, including mandatory jail time. While the minimum jail sentence is 120 days, but many counties are now insisting on at least 210 days imprisonment. Other counties are requiring 1 year imprisonment for a third offense DUI. Because of the serious nature of a third offense DUI charge, it is very important to hire an experienced attorney to ensure that your case is handled properly. 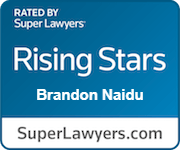 The Law Office of Brandon S. Naidu has the knowledge and experience to help you mitigate or avoid the serious penalties of a third offense DUI. Call (619) 363-4811 for your case evaluation.